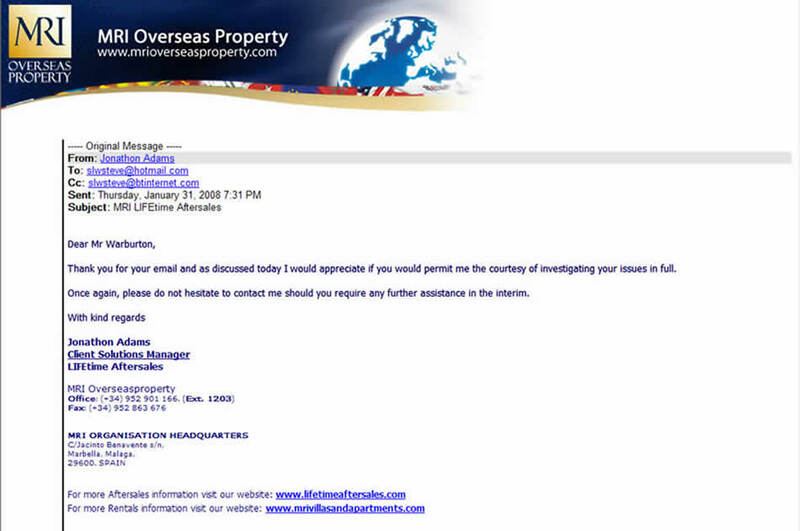 How did MacAnthony Real-estate International (MRI) deal with complaints? I can tell you it is not the way Mr. Darragh MacAnthony claims they do. I am not going to reproduce my original complaint letter to MRI. 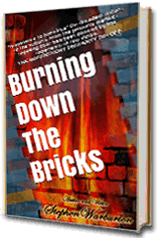 It was four A4 pages long, and repeats much of the content that is in my book, Burning Down the Bricks, and some of it twice. There was one further page of complaints against the Martinez lawyer group and two more pages of updated complaints submitted later. That complaint did generate a response, and that is what you are going to see next: an unedited, authentic copy of the original e-mail reply, in an image format. I bet some of you are expecting to see a blank space, indicating that the generated response was NOTHING! Well, not quite: take a look at it in all its glory and magnificence. One point that should be considered, at the time of making these complaints, I did not have the clarity or complete understand of the corrupt activities of MRI and Martinez-Echevarria lawyers as I do now, some seven years later. Over time from many different sources, the extent of the criminal operation of MRI has become exposed. I can now structure all the arguments of my case with clarity and confidence. The point to be considered is that all the Spanish lawyers I approached back in 2007 to 2009; never saw many of the points that are at present very obvious. One of those is that I was denied impartial and independent advice from the lawyers promoted by MRI. Both parties broke international and Spanish law, yet not one of the half-dozen lawyers I approached picked up on that. The action of the Martinez lawyers I have been informed invalidates all the contracts. The Excessive demand of commission payments by MRI from the contractors from the property sales prices, made them far from being any investment. In other words, MRI falsified its presentations on capital growth in an already collapse market. They blatantly presented a property to a client solely based on their commission gain, and not if the property was a good investment for that particular client’s requirements. The case is very clear cut, yet I cannot get anyone to do anything about it without an expense far beyond my means. I mean way beyond my resources; we are not only talking in the low thousands such as in a class action of £6,000, just to get the case going. Costs could rise up to £ 50,000, which could exceed £100,000 quite easily. It is a disgraceful situation, when this sort of criminal behaviour that destroys a person or families’ home, compliments “crime pays” through an inadequate system that only favours the wealthy. Furthermore, insufficient state legislation, European or local that does not provide the structure of law that can be utilised to put a situation like mine to rights. This allows crooks like MacAnthony and the Martinez-Echevarria lawyers to get away with it.